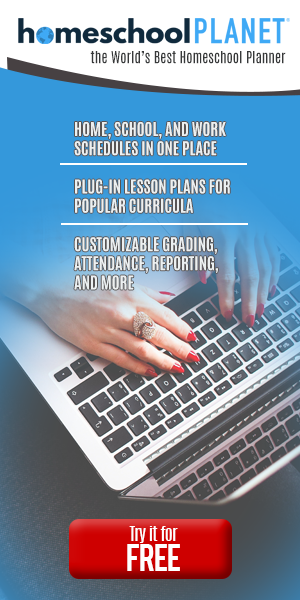 Many programs come with lesson plans already done for you. And in general, you can make those plans fit within your own four or five-day schedule. But what if you’re an eclectic homeschool that uses living books that don’t come with lesson plans? That was me for about six years. Before we found Sonlight, I made all my own lesson plans. But now I only have to write out a few things. Just don’t wait until the last minute if you’re planning ahead! I’ve done that too many times and always kicked myself for it. Anyway, let’s take a look at how to make lesson plans. If you are looking for a different day in the series, you can find them all here. Correct me if I’m wrong, but I think this is the way most people do it. Some plan six weeks ahead (for a term). Other (supremely organized) people plan for a whole year. If that’s your thing, Kristi Clover of Raising Clovers has an excellent method for this. I tried it once, it didn’t work for us, but I know many moms who successfully use it. It just depends on you and your family dynamic. Buying a homeschool planner is typically required if you want to plan ahead. Both digital and printed, there is a plethora to choose from. Just do a quick Google search and you’ll see what I mean. And then there are the other kind of people, those who plan as they go . . . This is what I do. I used to plan ahead but I kept having to go back and erase, change, or toss my plans altogether. So now, I plan as we go. The printable below is what I use to keep track of when we did what. There are eight different pages to choose from when you’re planning things out or just writing as you go. To grab the What Did We Do This Week planning pages, just enter your email below. I hope to get a video up here in the next few days to show you exactly how I used these. They’re pretty self-explanatory, but I think examples are always nice. Say what? Everyone calls their days by number (1, 2, 3 . . .) or the day itself (Monday, Tuesday . . . ). Each page is available in both versions. Once you decide which version you want to use, print those pages and let’s get started breaking down the material. To begin with, put the name of the material in the first column. Every book you’ll use is broken up somehow. Whether it be by chapter, lesson, page, section, module . . .
That term is what you’ll put in the second column. The idea is that you don’t have to continue to write the label (page, lesson, module . . .) every time for each day. You have to decide how quickly you want to work through the material in order to finish by the end of the school year. We school year round, so really we just keep going at whatever pace works for us in our current season of life. In the page above, you can see I used three rows for our science. One for the reading, one for the journal pages, and one for experiments. This way I can keep everything together in one place. For math, I only use one line. Don’t feel like you have to use every line. Pick a page that works well for you and customize it. The pages are very versatile in that you can pretty much use them any way you want. If you have any questions, feel free to email me via the contact form below or leave a comment! If you don’t want to miss a post, sign up below to receive all 10 days of this series in your inbox. Your planning pages are on their way to your inbox. I look forward to connecting with you in the future! Similar posts you might be interested in . . . I am definitely a plan as we go kind of mom… i just could not plan ahead and actually stick to the plan and then I got frustrated when the plan book was messy.